ဆီမီး-မေဂျာ ဝင်ရိုး (a) 17.57 ± 0.022"
↑ ၁.၀ ၁.၁ ၁.၂ ၁.၃ ၁.၄ ၁.၅ ၁.၆ ၁.၇ ၁.၈ ၁.၉ "Validation of the new Hipparcos reduction" (2007). Astronomy and Astrophysics 474 (2): 653. doi:10.1051/0004-6361:20078357. Bibcode: 2007A&A...474..653V. ↑ ၂.၀ ၂.၁ ၂.၂ ၂.၃ ၂.၄ ၂.၅ "VizieR Online Data Catalog: Catalogue of Stellar Photometry in Johnson's 11-color system" (2002). CDS/ADC Collection of Electronic Catalogues 2237: 0. Bibcode: 2002yCat.2237....0D. ↑ ၃.၀ ၃.၁ "Search for associations containing young stars (SACY)" (2006). Astronomy and Astrophysics 460 (3): 695–708. doi:10.1051/0004-6361:20065602. ISSN 0004-6361. Bibcode: 2006A&A...460..695T. ↑ ၄.၀ ၄.၁ "Spectroscopic Properties of Cool Stars (SPOCS). I. 1040 F, G, and K Dwarfs from Keck, Lick, and AAT Planet Search Programs" (2005). The Astrophysical Journal Supplement Series 159 (1): 141–166. doi:10.1086/430500. ISSN 0067-0049. Bibcode: 2005ApJS..159..141V. ↑ ၅.၀ ၅.၁ "The Sun and Stars" (2012): 219–236. doi:10.1007/978-3-642-22839-1_10. ISSN 1614-659X. ↑ ၆.၀ ၆.၁ ၆.၂ ၆.၃ "The diameters of α Centauri A and B" (2003). Astronomy and Astrophysics 404 (3): 1087–1097. doi:10.1051/0004-6361:20030570. ISSN 0004-6361. Bibcode: 2003A&A...404.1087K. ↑ ၇.၀ ၇.၁ Gilli G.; Israelian G.; Ecuvillon A.; Santos NC. ; Mayor M. (2006). "Abundances of Refractory Elements in the Atmospheres of Stars with Extrasolar Planets". Astronomy and Astrophysics 449 (2): 723–36. doi:10.1051/0004-6361:20053850. Bibcode: 2006A&A...449..723G. libcode 2005astro.ph.12219G. ↑ Pourbaix, D. (2002). "Constraining the difference in convective blueshift between the components of alpha Centauri with precise radial velocities". Astronomy and Astrophysics 386 (1): 280–85. doi:10.1051/0004-6361:20020287. Bibcode: 2002A&A...386..280P. ↑ Reipurth, B., Mikkola, S. "Formation of the Widest Binaries from Dynamical Unfolding of Triple Systems". Aohoku Place, HI: Institute for Astronomy, Univ. of Hawaii at Manoa. December 6, 2012. PDF. Retrieved 09.28.2015. ↑ Anosova, J (1994). "Dynamics of nearby multiple stars. 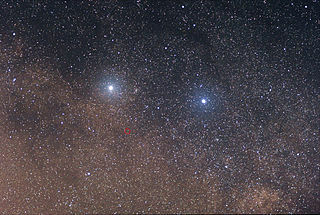 The α Centauri system". Astronomy and Astrophysics 292. Bibcode: 1994A&A...292..115A. ↑ Matthews, R.A.J. (1994). "The Close Approach of Stars in the Solar Neighbourhood". Quarterly Journal of the Royal Astronomical Society 35: 1–8. Bibcode: 1994QJRAS..35....1M.